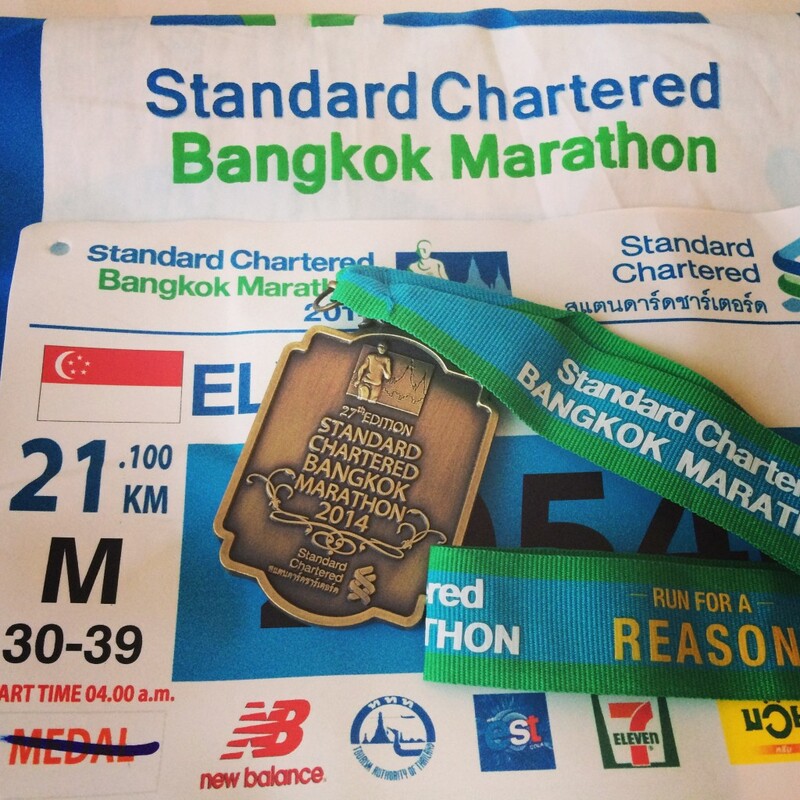 Race Review: Standard Chartered Bangkok Marathon 2014 – A Good Spirited Run In The Land Of Smiles (by 'elf') | JustRunLah! After choosing the Penang Bridge Marathon over Standard Chartered Marathon Bangkok last year, we decided to give the event a go in spite of the political turmoil that hung over Thailand. 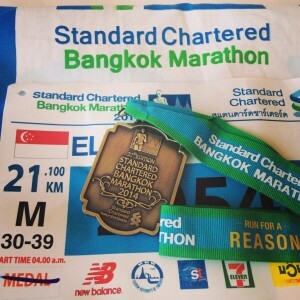 Hence in March, with the protests still ongoing(before the coup), we signed up for the Standard Chartered Bangkok Marathon. 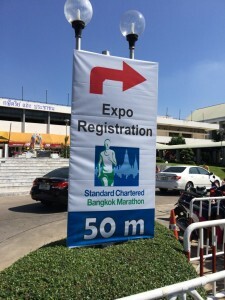 Registration was done via the official race agent(which all foreigners are required to unless they are residing in Thailand) as they have different registration rates for locals and foreigners. It is important to register only with the official race agents as there have been reports of other race agents informing that they failed to secure any slots a few months before the event. As usual, the hunt for cheap tickets and cheap lodging began. 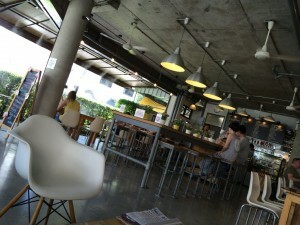 By June, we had secured our tickets and lodging and were just hoping for the situation in Thailand to improve. I headed in on a Thursday evening as I wanted to collect my race pack earlier(and because the ticket was cheaper!) 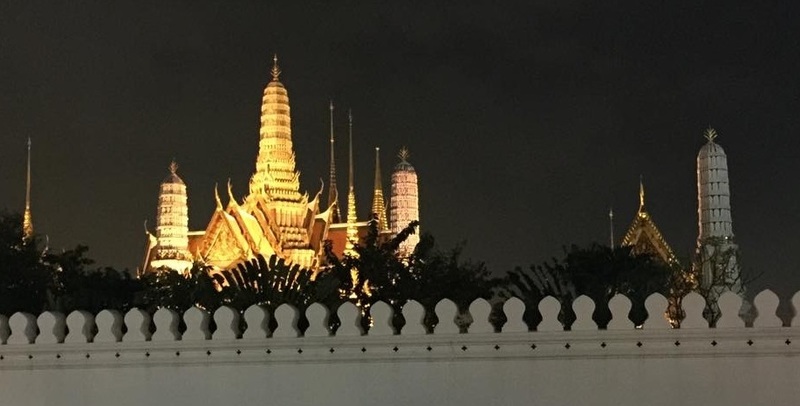 Traveling in on my own, I was determined to keep to a low budget and hence on arrival at Don Muang Airport, I took an express bus to the nearest BTS station. Anyone looking to take this bus at Don Muang should keep a lookout for sign(facing the wrong direction) that says ‘A1 Shuttle Bus’ at the exit for Airport Limousine Ticket Holders(near tourist information). 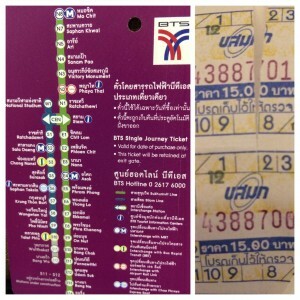 The ride which costs 30 Baht takes you to Mo Chit(the BTS station located at the famed Chatuchak Market). From there, you can take also take the MRT(BTS is above ground while MRT is the subway) to your destination. As always, taxis and tuk-tuks are on hand for hire. 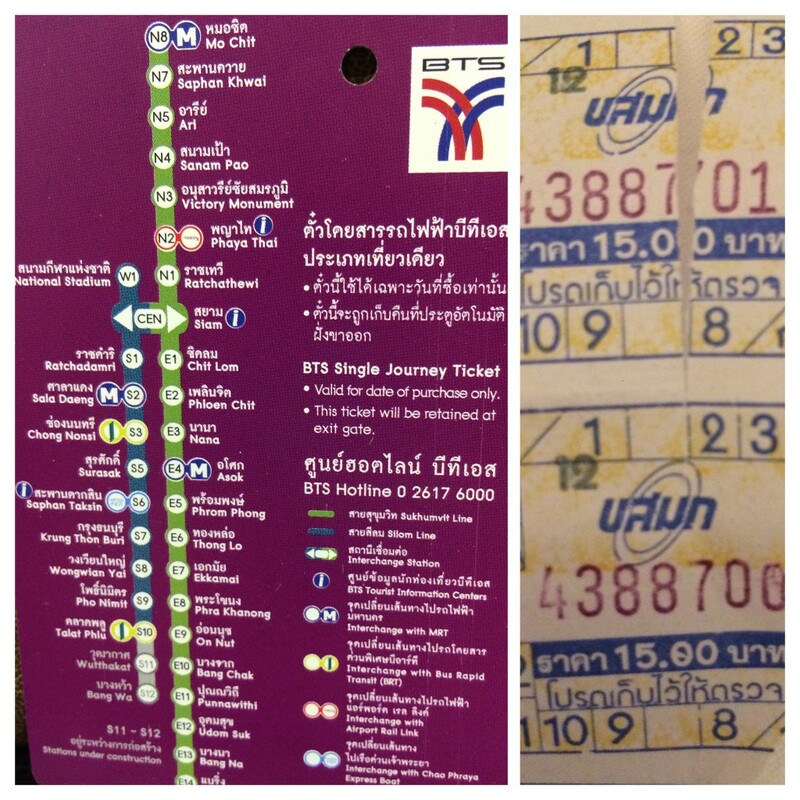 My stay was located at Makkasan and hence was not near to any BTS station. However, bearing in mind low-budget, I took the BTS to Chitlom(Station for the 4-faced Buddha) and took a 20 minutes walk to the hotel. By the time I checked in, it was already about 2300hrs and my dinner for the night was well, McDonald’s. 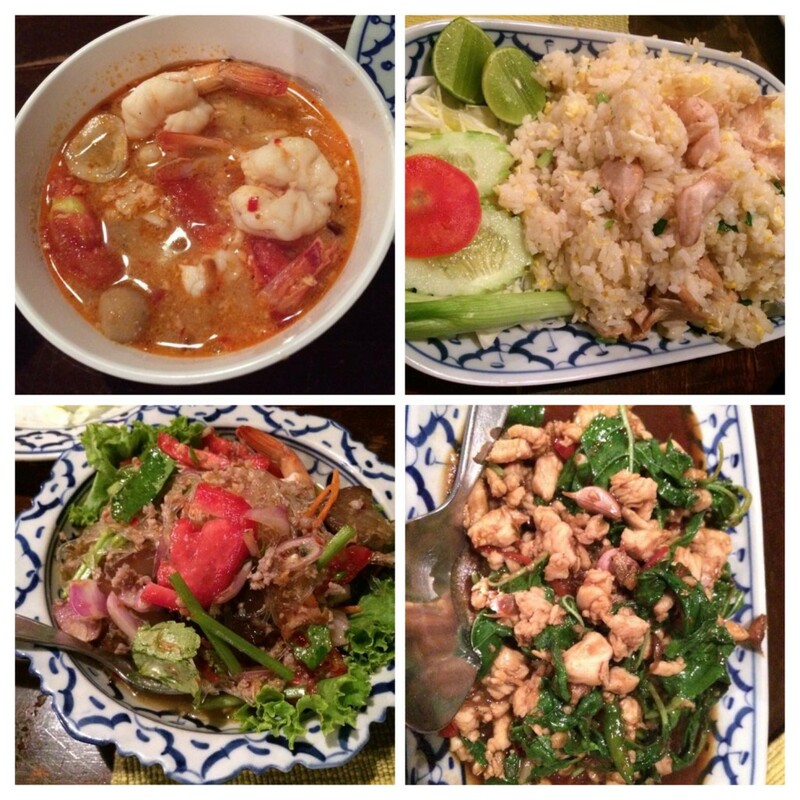 Total spending for the night – 221 Baht($8.70SGD). Even though my initial plan when I booked my flight was to do an early race pack collection, I was not able to collect the race pack as the race expo was only on Saturday – pretty strange arrangement by the organizers . Hence Friday was a free and easy day while I awaited the arrival of my race buddies. By the time we met, it was already 2200hrs and the only place we could get proper food was this restaurant at Siam Square. 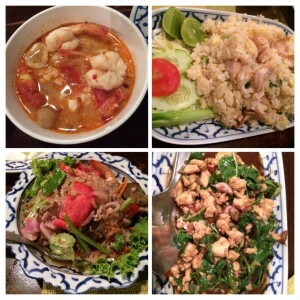 While pricey, it did give them a chance to sample Thai cuisine. Feeling ‘adventurous’ on Saturday morning, I took a motorcycle cab as I switched hotel. Motorcycle cabs are basically available at every corner and you can spot them with their orange/pink vests as they gather together while waiting for passengers. As with Tuk-Tuks, fix a price with them(although they do have a price guide to specific places in Thai) and off you go. While I did end up paying higher than the locals, it was an experience and with their ability to weave in and out of the traffic(some guts required), it was understandable why many engage their services. After meeting up, we proceeded to the race-pack collection area via Tuk-Tuk. Despite the hotel staff helping us to bargain the price, as we moved off the price increased with the reason of “Oh I didn’t know it was 4 of you.” Nevertheless, we agreed to the 20 Baht increase. We arrived at the Royal Thai Army Club in about 15minutes the banner on the outside showed that we were at the right place. We proceeded to the second level and for the first time, was asked to sign a waiver as well as release form for the race pack. We also had to refer to boards which listed all runners to get our bib number to be written on the form. After completion of the form, we went into another room, whereby the locals were separated from the overseas runner. Overseas runner get to collect both their bibs and t-shirt together while locals get only their bib and have to head downstairs to collect their t-shirt. The ‘shocker’ for the race pack collection is that the race medal is in the race pack. I guess for some this is somewhat disappointing as they have yet to earn the medal. But logistically, it is probably a good move as well – no requirement for additional volunteers to hand over medals after the race. After collecting the race pack collection, it was back to being tourists again and we headed to the Chatuchak market for a couple of hours, another couple of hours at Platinum mall before ending the day (early) with a foot massage as we prepared for tomorrow’s foot pounding. As in KL, the marathon buddies got up at about 0115hrs before heading to the start point. We got ready at about at about 0315hrs and made our way to the start point, whereby there was once again a carnival feel to it with music by a band on stage. Everyone seemed relax – standing/sitting by the sides waiting for the race pen to open – nobody standing by eagerly to be the first. When we flagged off at 0400hrs, I was surprised by the rather leisurely pace adopted by most runners. The first slope of the race came early at around the 1km mark as we went up the Phra Pinklao Bride over the Chao Phraya River and followed by another at 3km mark as we went up an elevated road. The good thing was that as we reached the top you could feel the morning cool air welcoming you. U-turn point came early at 4km mark and the merge with the full marathon runners came at 5km(about 26km for the full marathon runners). It was however not really that crowded still as the entire highway was closed. At the 8km mark, we crossed the Rama 8 bridge – which although not encouraged, is probably one of the few selfie points along the route. The rest of the route was pretty flat with not much sights but certainly unique smell as we passed the Dusit Zoo as well as the Royal Stables(or Equestrian Club) between the 12-14km marks. A point to note is that on these roads off the highway, vehicles are moving along the road by the side of the runners Near to the 15km and 16km marks are another 2 selfie points at Anantasamakhom Throne Hall(most Thai runners made a Wai in the direction of the Throne Hall in respect) and United Nations Conference Center respectively. As we approach what we thought was the end point due to the fanfare, a rather large group of enthusiastic students from Thammasat University out to show their support around the 19km mark, would probably be game for a photo or 2. Turning into the finishing stretch(other than seeing the Grand Palace,we couldn’t really tell as there was no finishing arch as with most races), it was quite a ‘unique’ experience as you didn’t know where the end point was! After we crossed the finishing point – that’s where everyone started to walk – we grabbed a drink before heading back to the hotel, foregoing the free food and fruits which is available to all runners. Water points were well spaced – 2-3kms are what we would term as undermanned. There are at most ten tables at each water point with 2 about 2 volunteers per table or 5 for 2 tables. However, despite this they manage to clear the queues pretty quickly and I must also commend most runners for being patient as they await their turn. Some of the water points are supplemented with bananas(they are cut into smaller pieces) as well as water melon. An issue I have with the race though is the distance markers. The first marker I saw was a 4km marker at the 6km mark and the next was the 10km marker at the 8km mark! Subsequent markers were about 1km and the off and the last marker I saw for the half marathon was a 20km marker at the 18.5km mark. There was even a 40km marker at the 41km mark – pretty demoralizing for a full marathon runner if you think there were 2 kilometers left when there was only 1 left! On the overall, this is another recommended race despite some hiccups – water point issues and distance markers are something seasoned runners will easily brush off. The support from the locals as well as the police/military(assisting with the race setup and stopping traffic – note the minimal road closures other than the highway)can definitely be felt and all tourists stay, no matter how short, is always welcomed. If anything as my race buddies would attest to, come for a short shopping trip and enjoy the Thai massage – something which they all did when time was available even though the hotel was slightly out of the way. In any case, the hotel of choice is The Warehouse, located at Thanon Bunsiri near to the Temple of The Emerald Buddha which is also the race start point. I must admit that what caught my eye initially when bookings were made was the price then followed by the location. In the end, it turned out to be a rather good pick as amenities, though not 3/4 star is more than sufficient for anyone looking for a place to stay for the race. They also have a cafe which is able to satisfy basic food requirements (no supper though). The staff there are also very helpful and their help with the taxis/tuks-tuks will help to overcome issues getting out to the shopping areas. 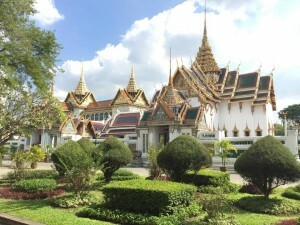 Cultural area such as the temples and the Grand Palace is no issue as they are all within walking distance. The above estimate is based on a triple sharing room(per person) and shared transport costs including air port transfer but excluding massage and shopping. We even managed to squeeze in a trip to Hard Rock Cafe on the above budget. Click here for more post from Elf. thanks for this Elf. I did my first race in Bangkok – the 10km SC Bangkok Marathon. very good memories with refreshing light rain. Running pass the temples and over the bridge were quite nice, topped only by the food and a post-run Thai-massage! Hi Thanks for your write up. Need seek your advice as you mention register from the official race agents. Did you booked via from Gotorace ? Last year they were known as AdventureAsia or something like that and this year they ‘rebranded’ slightly but I believe they are the same. I have also registered with them this year.